Whether the classic pink watermelon or the shiny yellow watermelon, watermelons are a popular favorite fruit of many that's typically seen as a common symbol with summer, sunny beaches and hot temperatures. Especially delicious in taste and conveniently nutritious to the body, watermelon is naturally packed full of cooling, hydrating and other healing powers, containing a whopping 96% of water as a whole. 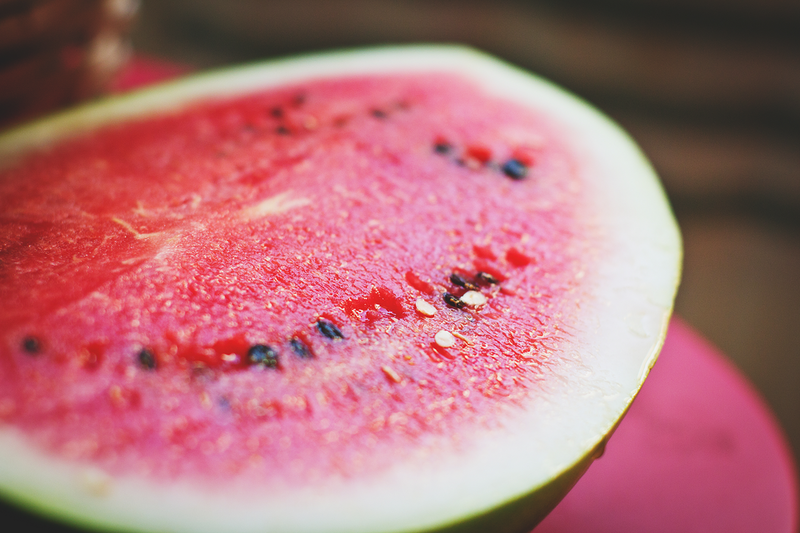 Watermelons also offer a wide array of many other natural health benefits for the human body but, we'll just keep it focused on staying cool for this article (with other facts and dietary nutritional information about watermelons to follow). Some call them vegetables and some call them fruits but, the specific nomenclature truly does not matter for this list's sake as cucumbers are another popular food favorite that is full of water with a noted 96% of its content being water. Similar to their cooling food companions, the watermelons, cucumbers also offer both hydrating and cooling effects when consumed. Cucumbers are usually best known as a compliment for a fresh salad recipe but they can also be eaten straight raw as a true fast food or even juiced as a fully nourishing, hydrating and cooling drink that comes full of H2O. Regardless of how you get them in, cucumbers are a check list item to include on your grocery food shopping list to keep your body cool during the hot, summer like months. Lettuce, a popular hydrating food favorite that is also commonly known to be eaten with salads is yet another cooling food that provides a nutritional value of 96% water for the human body. And, just like cucumbers, lettuce can be eaten as is, raw (with salads, as a healthy "tortilla alternative" for plant-based wraps, thinly sliced and topped on veggie burgers, et al) or used in a juicer to hydrate, cool and heal the body from within. It should also be noted that although there are many different varieties of lettuce to be found within the leafy greens food family, all varieties offer the same exact nurturing effects in terms of hydration and cooling. So, if you have yourself a favorite lettuce type, you are of course welcome to stick with that specific one but, feel free to explore a little and try some different kinds of lettuce while you enjoy the same cooling and hydrating benefits. Not venturing too far from the vegetable shelf in the fridge next to the other nurturing and healing ingredients typically used with salads, let's talk about celery, another high water content food (with 95% water content) that's easy to eat and extract juice from. Adding just the right amount of texture (and nutrition) to just about any healthy recipe you can think of, celery is a fully hydrating food that naturally cools the body with its water (and electrolyte) content while also aiding with digestion, reducing inflammation, alkalizing the gut and a heaping handful of other notable healing effects for the human body. Just like all other fruit and vegetable produce, it's best to buy your celery organic but eat what you can find from your local grocery and farmer's markets so you can keep your body cool and hydrated all year round. With 94% water content, tomatoes are next on the list of water-rich foods that can be eaten to keep cool during hot weather temperature times. And, similar to their salad counterpart, lettuce, the list of different types of tomatoes that you can find throughout the produce section is full of different styles and varieties (each usually offering its own unique flavor and texture with the same hydrating benefits included). Tomatoes can be great as a quick and healing fast-food, eaten raw and alone or, they can also be used alongside other popular salad ingredients as well as healthy juice recipes, too. However you choose to consume them, add some tomatoes to your daily food intake and reap the hydration and cooling effects that the tomato has to offer for its consumer.